Making a batch of 1,000 DVDs or Blu-Rays isn’t always cost-effective for low budget documentaries unless you’re sure that you can sell them all. But distributing your film online can cost next to nothing– if you choose an option that doesn’t have a setup fee or an annual fee (which unfortunately Vimeo does do– to the tune of $200/year regardless of whether you sell any downloads or not). If you pick your distribution services right, you can get away with just paying a small percentage of each actual sale to the distributor. These tips work for indie filmmakers, whether you’re making shorts or feature-length movies. Gumroad – Set your own price and sell your film online. Gumroad works with either streaming or downloads and can do rentals as well. No annual fee, you only pay a tiny percentage of each sale. Quite cost effective for low budget documentary filmmakers and you can even bundle deleted scenes with your work. Integrates with your own website. Square Merchant – Online and in-person credit card processing for your films, whether you’re selling DVDs online or at events, even comes with a free credit card reader that plugs into your iPhone or Android device. No annual fee and a much smoother checkout experience than PayPal. Integrates with your own website. Amazon Createspace – Get your film in front of millions of Amazon customers. Unfortunately, you can’t quite set your own prices (Amazon sets them for you based on your request) but they can produce DVDs for you one by one and ship them to your customers, as well as video on demand streaming rental and purchases. No annual fee. VHX – VHX is an online streaming distribution platform that allows you to upload your films and sell them to your audience without having to create a complicated website or deal with any of the tech stuff. VHX is especially great for episodic content because it can manage branded subscription services, not just one-off films. You can set your own prices, offer rentals and purchases and even build coupon codes. You can get started and sell for free, but once you’ve uploaded more than 10 hours of content you will need to begin paying. Vimeo Pro – Once you pay a subscription fee of about $20/month (or a discounted flat rate for the year), a subscription to Vimeo Pro gives you tools to sell your films. You can set your own prices and upload art according to their specifications to create beautiful-looking sales pages with trailers, synopses, stills, and more. Note that unlike some other platforms with Vimeo Pro you’ll need to pay a monthly fee whether or not you actually make any sales. On the flip side, however, you also get access to expanded Vimeo video hosting features like advanced branding of color-schemes of the video embeds on your website, expanded analytics, and more. YouTube – If you really and truly want to get as many eyeballs for your film as possible, nothing beats putting it up for free on YouTube, which allows you to monetize it through ads (or if you meet the eligibility requirements, you can offer it as paid content on YouTube). But even if you want to sell your movie through a more traditional route, putting a great film trailer up on YouTube with a link to purchase the film is a must. Selling a streaming or downloadable version of your film online can be a great way to get the film out there for next to nothing and also get some buzz for yourself as a filmmaker. We also recommend collecting the email addresses of your buyers (which Square and Gumroad allow you to do– but Amazon does not) so you can let them know when your next film is out. Here are some additional tips to consider, regardless of what platform you choose to sell your films online with. Upload your trailer to YouTube – Whether or not you’re hosting the film on YouTube, it’s worth uploading the trailer there and tagging it with lots of related tags and giving it a nice, long keyword-rich synopsis in the description area. You should also include a link in the description to where people can purchase/stream the full film. It’s also worth including a URL in the video itself as text on screen in case someone is watching it on a platform where they can’t see the description while they’re watching (like on a cell phone in full-screen mode or embedded in another website). Uploading your trailer to YouTube will make it much more findable. Market your film to an email list – As you’re making your movie, keep a running list of email addresses from people who are interested in it that you interact with along the way. Send these people (along with crowd-funders or friends) regular updates on your progress as you go through the process. By the time your film is ready to be released online via streaming platforms, you may already have a built-in audience. On your website, you can also include an email signup list for people who come across your film’s website and are interested in watching it once it’s finished. Make sure you also capture people’s first names in addition to their email addresses (but don’t make the signup form too long or complicated because fewer people will fill it out!). 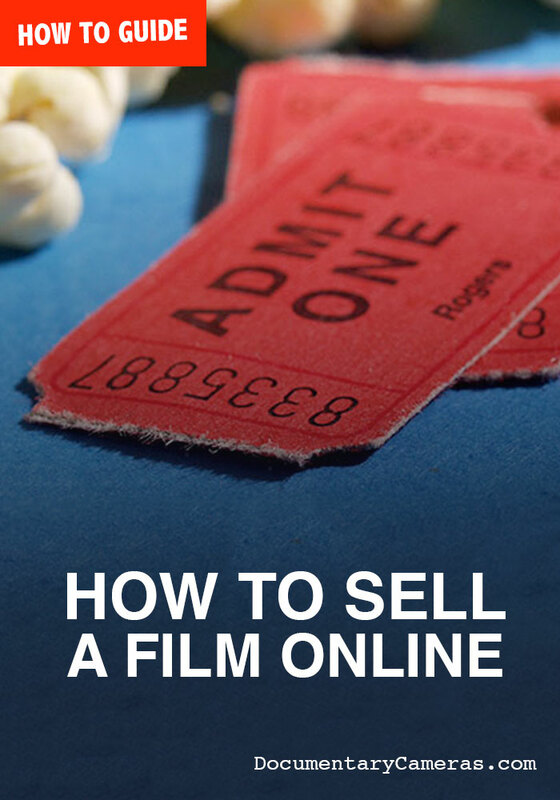 Make the option to purchase your film easy to find on your website(s) – If you have an official film website, make sure it’s easy to find the page where people can buy the film. This means ideally putting it in the menu/navigation and also sprinkling links to it throughout the website on all sorts of other pages where it’s relevant. If you have other websites, like a professional website as a director, consider putting links to buy the film there too. Generally speaking, the more links there are to that purchase page, the better. What is the Best Cheap Documentary Camera for Filmmaking in 2016? Next Post: What Are The Best Documentary Film Schools?